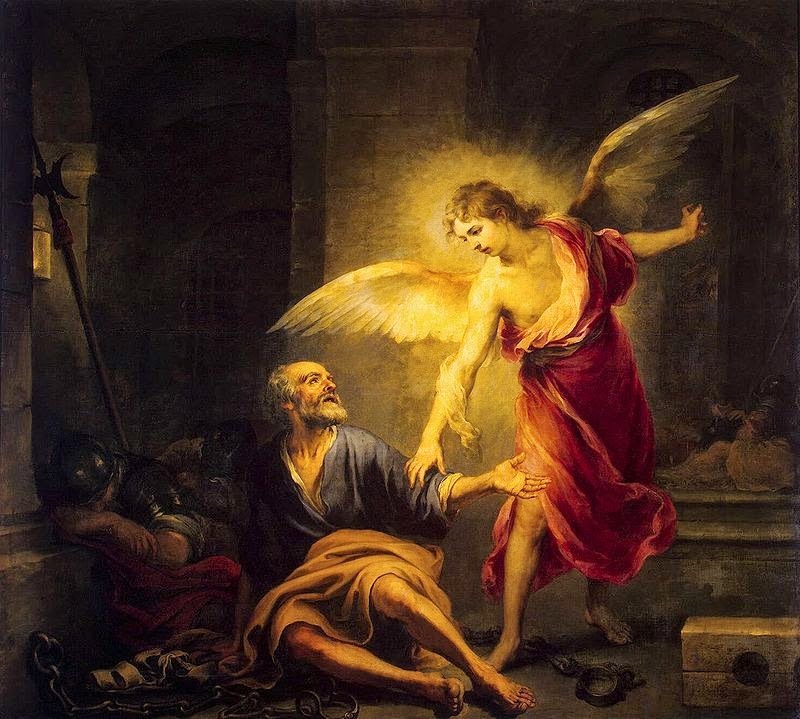 The feast of St. Peter in Chains was a feast day commemorated on August 1st to recall St. Peter's miraculous release from imprisonment and the dedication in the 4th century of the church Pietro in Vincoli - St. Peter in Chains in Rome . 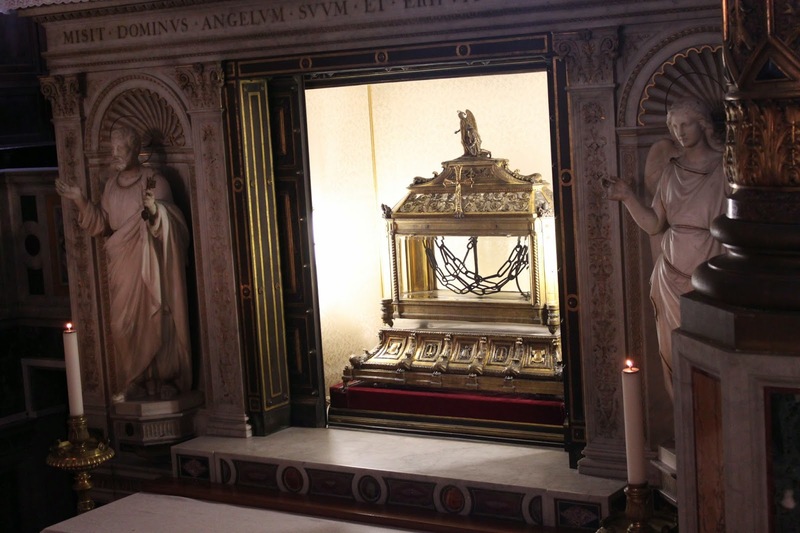 The church holds the reliquary containing the chains of St. Peter. The feast day is no longer on the current liturgical calendar but definitely one that can be recognized. I think the imagery of chains is very vivid - one that makes an impression, so would be good to talk about and discuss with our children. This feast was also called "Lammas Day" or "Loaf Mass Day" because this day was offered as thanksgiving for the wheat harvest, used for the bread that becomes the Eucharist. Florence Berger discusses the connections between the liturgical year and agrarian life. Bread is the most common product made from wheat – it is used to celebrate in all cultures and is symbolic of life and abundance. We have discussed its significance in past posts here; Staples of Our Feastday Celebrations Part One: Bread and Bread – A Staple of the Liturgical Year Celebrations. So making a bread of some sort to commemorate this day would be appropriate. And shaping it into links to form a bread chain uses that vivid image to a dramatic culinary advantage. Use any bread or pretzel recipe, such as the one suggested by Jessica in her St. Peter’s Keys post or even a pre-made refrigerator dough in a pinch. Dissolve the yeast in warm water. Add the sugar and salt. Mix in the flour and knead until the dough is smooth. Roll out dough and form into desired shape - in this case into links. Connect the links to form a chain. Brush the dough with a beaten egg for a golden finish if desired. Bake in a preheated oven at 425˚F for 15 minutes. Another idea that came to mind with the chain shaped dough was to place it along the outside ring of a pizza crust so the pizza would be circled in chain. A dinner idea for the feast day. Blessings to all! Because of the symoblism of this feast and since St. Peter is their patron, The Priestly Fraternity of St. Peter has asked all of its apostolates around the world to dedicate Friday, August 1 to a day of prayer and penance for the Christians who are suffering terrible persecution in Iraq, Syria and elsewhere in the Middle East. Since today is the feast of St. Anne, I am offering a variation on the lace cookies - Lace Cookie Bowls. These delicate and tasty edible bowls are great for fruit or ice cream. Follow recipe for making the florentine cookie dough from earlier post. In the previous recipe for smaller cookies, small balls were formed. 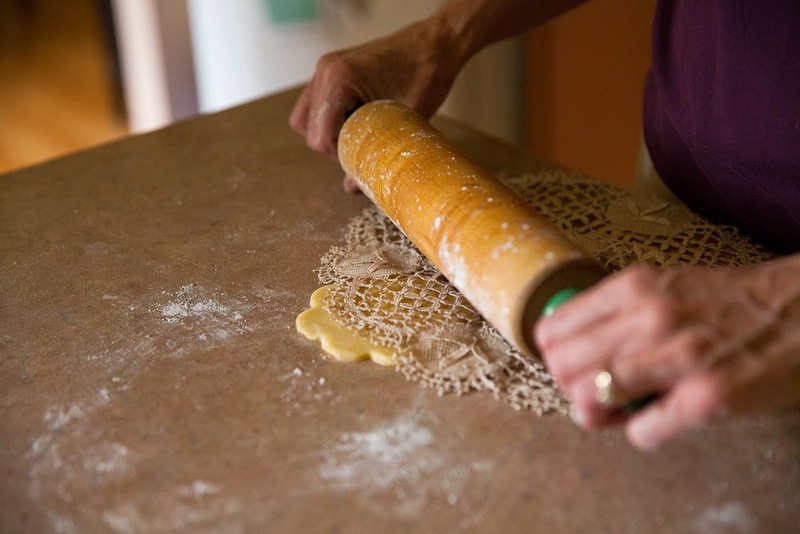 In order to make the lace cookie bowls you need to form much larger balls of dough - approx. 2 inch in diameter. Place on baking sheet lined with parchment paper, 2 or 3 to a tray as they will spread a lot. Place in preheated oven - 350 degrees. Bake 1 pan at a time, until the cookies are thin and an even golden brown color throughout, rotating pans halfway through baking time, about 10-12 minutes. Cool on baking sheet for a few minutes until they can be handled. They need to be cool enough to remove from tray but not yet have hardened. While still soft place over a small inverted bowl and press down to form bowl shape. Let cool until hardened. Filled with ice cream these are a refreshing treat for a mid-summer feast day. While we used chocolate because it was what I had on hand, another great ice cream choice would be spumoni, which includes both a red (cherry) and green (pistachio) color - the colors associated with St. Anne. Or any red/green combination - like strawberry ice cream with a sprig of mint or green tea ice cream with fresh raspberries on top. There are many fun and refreshing combinations in those colors. 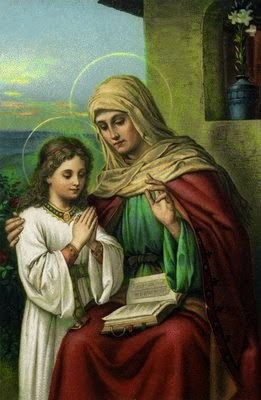 Dear Saint Anne, we know nothing about you except your name. But you gave us the Mother of God who called herself handmaid of the Lord. In your home, you raised the Queen of Heaven and you are rightly the model of homemakers. In your womb came to dwell the new Eve, uniquely conceived without sin. Intercede for us that we too may remain free from sins. Amen. During a visit to Compostela, Spain a couple years ago I became more familiar with the images and symbols of the Camino de Santiago or the Way of St. James, the pilgrimage routes to the cathedral where his remains are buried. 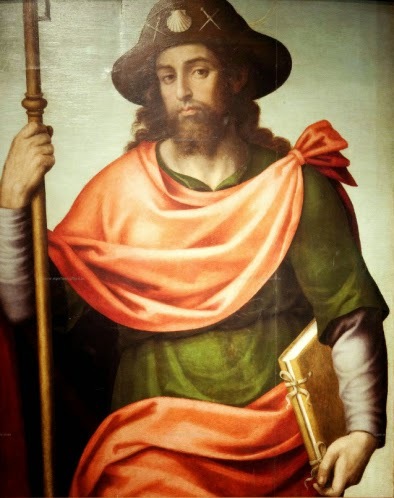 St. James, Santiago in Spanish, is the patron saint of Spain and of pilgrims, particularly the pilgrims on the Camino. St. James is usually depicted in one of two ways: a fighter or a pilgrim. As a fighter, he is Santiago Matamoros or St. James the Moor Slayer. It is in this guise that he appeared to the local armies who were trying to drive the Moors out of the Iberian peninsula. He is also portrayed as a pilgrim, Santiago Peregrino. He is dressed in robes with the traditional cockleshell on his hat, a bag with supplies, a gourd for carrying water and a staff, which are traditional symbols of the pilgrim. A pilgrim is a traveler (literally one who has come from afar) who is on a journey to a holy place. The English word for pilgrim derives from the Latin peregrinus which means foreigner. The Spanish word for pilgrim is peregrino while in Italian is is pellegrino. It was there that I made that connection that a favorite sparkling mineral water from Italy, San Pellegrino, shares this pilgrim name. The sparkling water is named for the town in Italy where the water is bottled, which in turn was named after a French bishop - St. Peregrine which comes also from the Latin peregrinus. Since St. James is the patron saint of pilgrims, what better way to toast St. James than with a glass of "pilgrim" water. 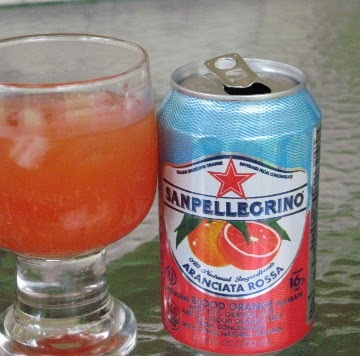 San Pellegrino waters are a refreshing drink - whether the natural sparkling water or one of their flavored varieties. Our family loves these and looks for any excuse to celebrate with them. It is a great last minute idea because there is no preparation, just buy a bottle or a six-pack and you are ready to go. Particularly for this feast day the blood orange flavor, Aranciata Rossa, seems fitting since St. James was a martyr and shed his blood for the faith. Santa Maria, pray for us." With the recent feast of Blesseds Zelie and Louis Martin I shared the connection to the lace and lace making. Lace is such a beautiful and delicate textile art and the look can translate to the kitchen to some degree. 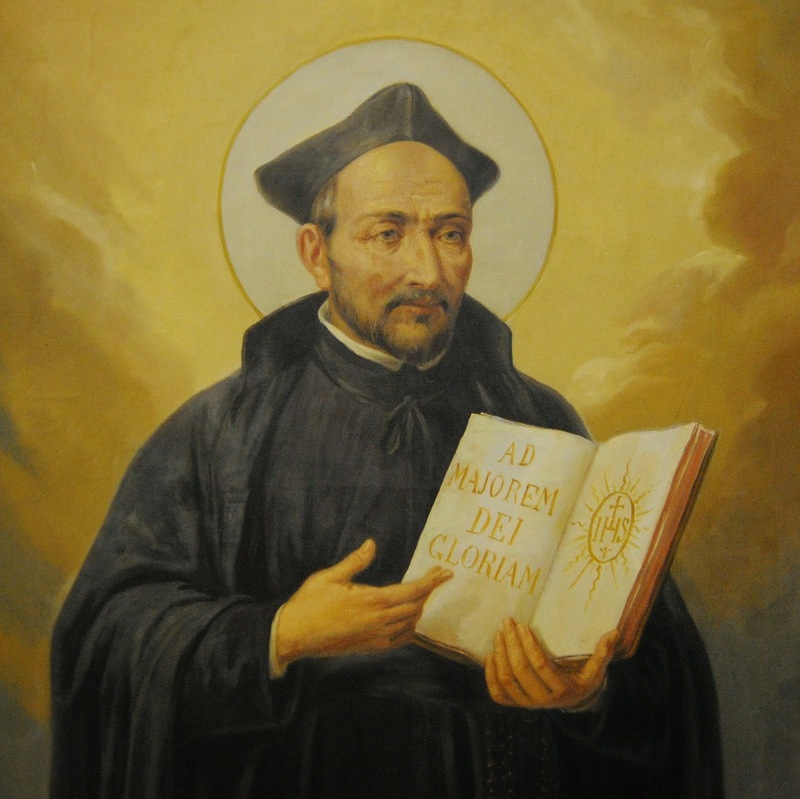 July 13 is the anniversary date of Zelie and Louis Martin and follows their feast day by one day. So since we are still thinking about the Martins, I am adding an additional lace themed treat idea for today. 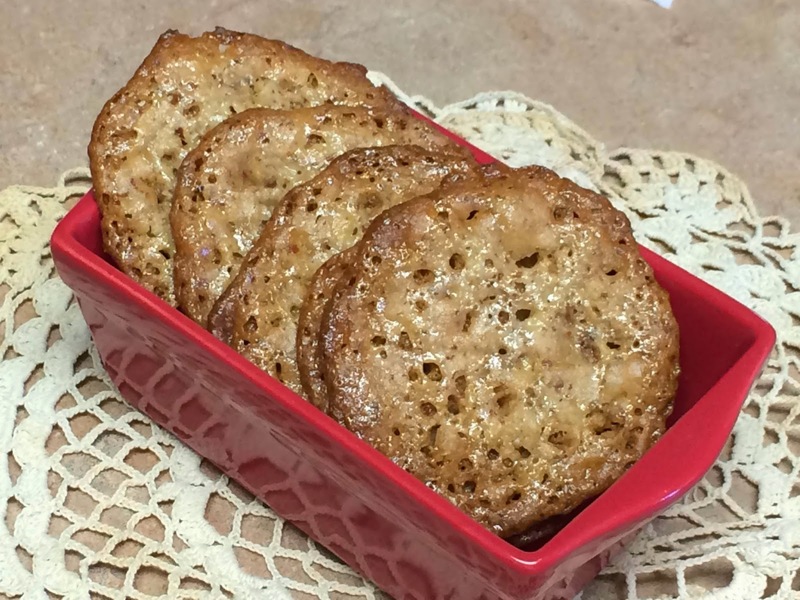 The florentine is a a cookie commonly called lace cookie because of the natural lacy open hole appearance it gets while baking. There are variations on the cookie but the traditional one is almond or other nut based. Candied fruit, coconut, oats are sometimes used in the variations. Sometimes just a honey/sugar and butter base such as these here. Pulse the almonds in a food processor until finely chopped, but not pasty. Stir together the almonds, flour, zest and salt in a bowl. Put the sugar, cream, corn syrup and butter in a small saucepan and cook over medium heat, stirring occasionally, until mixture comes to a rolling boil and sugar is completely dissolved. Boil for 1 minute. Remove from heat and stir in the vanilla. Add sugar mixture to almond mixture and stir just to combine. Cool for 30 minutes. 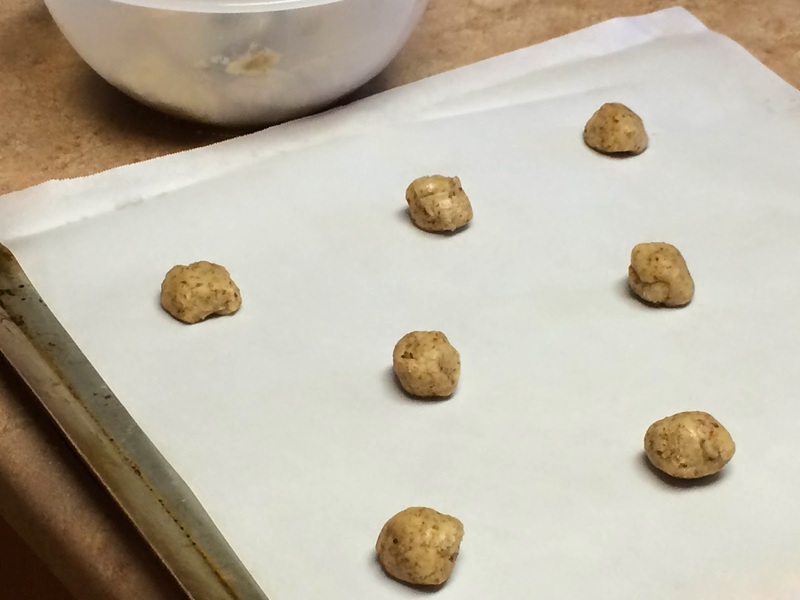 Scoop rounded teaspoons (for 3-inch cookies) or rounded tablespoons (for 6-inch cookies) of batter and roll into balls. 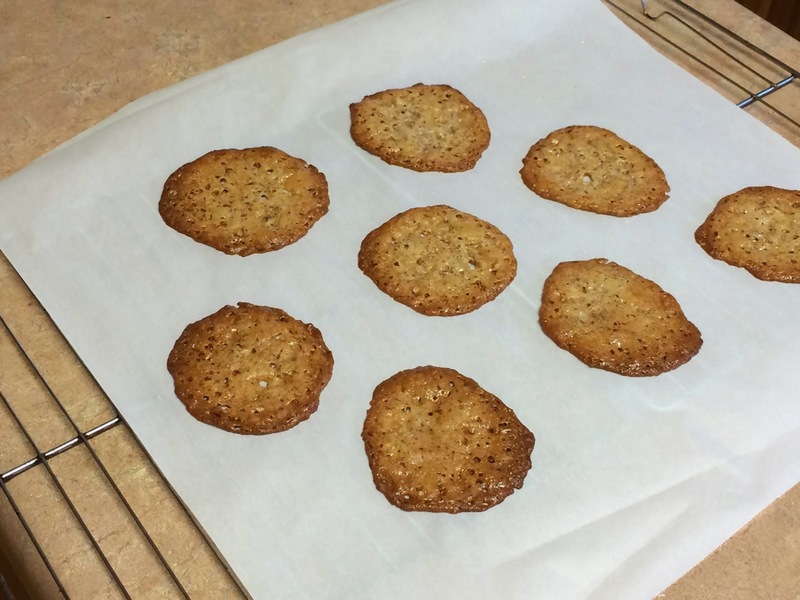 Place on baking sheet lined with parchment paper, leaving about 3 to 4 inches between each cookie. They will spread considerably in oven. Place in preheated oven - 350 degrees. Bake 1 pan at a time, until the cookies are thin and an even golden brown color throughout, rotating pans halfway through baking time, about 10 minutes. Cool on baking sheet for 5 minutes, then transfer to racks to cool. You can serve plain or drizzle with chocolate. You can also put a filling (jam, cream, chocolate, ice cream) between two cookies for a sandwich style. Written by St. Thérèse of Lisieux of her parents, Bl. 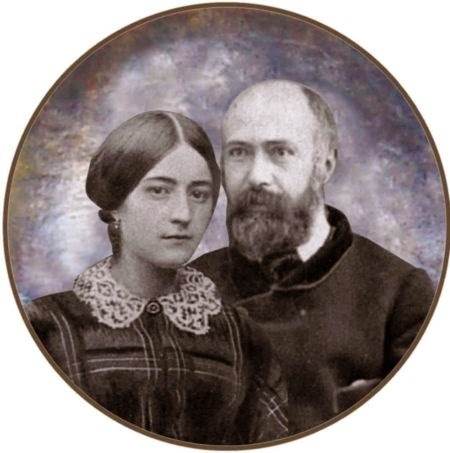 Louis and Zélie Martin, who married on July 13, 1858 and whose feast is celebrated today, July 12. The couple were married for nineteen years before Zélie’s death from breast cancer in 1877. They created a close, caring, family home, where love of God and neighbor were taught and practiced. It was in and by marriage that Louis and Zelie were to gain their own sanctification and set a heroic example for others. Their example illustrates how marriage can be a starting point of the journey to holiness made in the company of a spouse. Blessed Louis Martin and Blessed Zélie Martin were beatified as a couple in October 2008. It was only the second time in history that a married couple has been beatified. Marie Azelia (known as Zélie) Guerin was born near Alencon France in 1831. This is an area of France renowned for its beautiful lace making. Zélie was an accomplished lace maker in the tradition and style of the region. After she married Louis Martin in 1858, they settled in Alencon and conducted their businesses where Louis took on the business management of Zélie’s lace making enterprise. 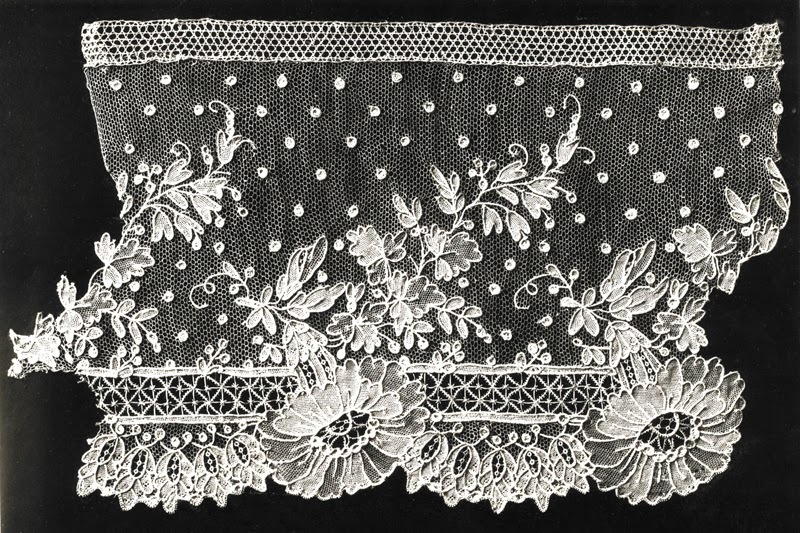 An example of her beautiful lace can be seen here. 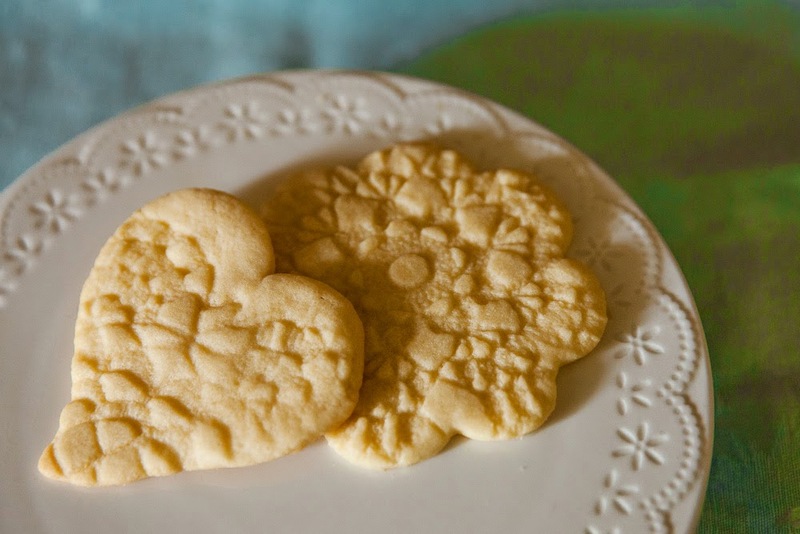 This is a simple idea to incorporate a touch of subtle lace effect into a cookie for the feast day. Using any sugar cookie recipe, just roll out the dough and cut out basic shaped cookies. Keep the dough a little thicker than you would normally when you cut the cookie as you will be pressing down lace and it will flatten slightly. 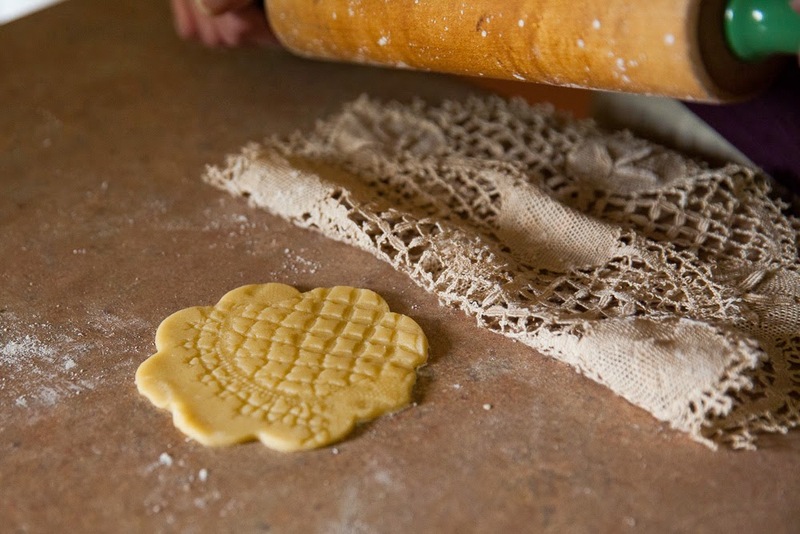 Place a lace or crochet doily (or any piece of lace with large, deep design would work) over the cookie dough and roll gently but with enough pressure to press the design into the dough. Remove lace, place cookies on baking sheet and bake until golden. As mentioned any sugar cookie recipe (or even pre-prepared refrigerator brands) could be used. If you are looking for a good sugar cookie recipe, I like this one from a Midwest parish cookbook. Put softened margarine in large bowl of mixer. Add sugar, eggs, and vanilla. Beat until mixture is light and fluffy. Mix in flour, baking powder, and salt. Blend until smooth. Chill at least one hour. Roll small amount of dough at a time on floured board. Cut into desired shapes. Put on ungreased cookie sheet. Bake at 375 degrees for 8-10 minutes. While Bl. Zélie was specifically a lacemaker by trade, there are numerous saints who are listed as patrons for lacemaking and lacemakers. These cookies would be a fitting addition for a treat on any of their feast days. Mix up a box of Betty Crocker Fudge Brownies, or your favorite brownie recipe, and bake as directed in two Torte Pans. (I used my Pampered Chef Torte Pans.) After the brownies have cooled combined cream cheese, sugar, and vanilla to divide and spread over the top of both tortes. Top with blueberries and chopped strawberries. 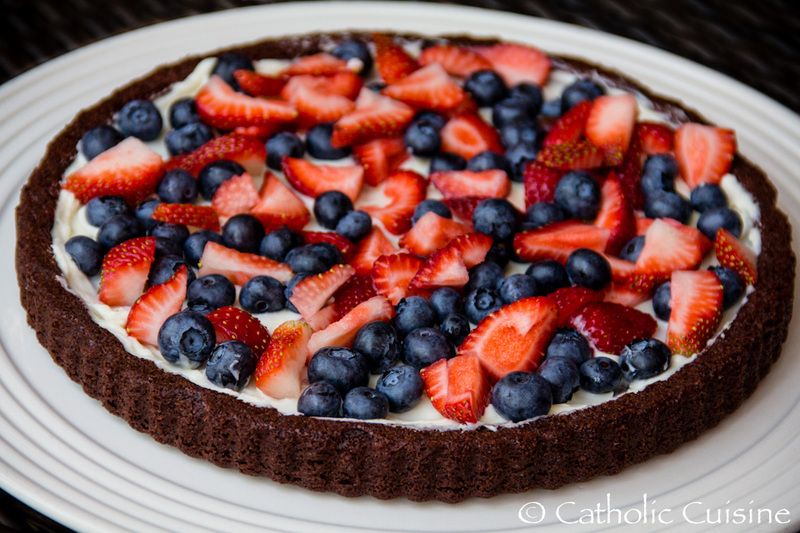 Find additional Independence Day recipes in the archives!